Storage: Store at or below -20 ºC. Solubility: Soluble in DMSO at 200 mg/mL; soluble in ethanol at 100 mg/mL; very poorly soluble in water; maximum solubility in plain water is estimated to be about 10-20 µM; buffers, serum, or other additives may increase or decrease the aqueous solubility. Disposal: A. More than 630 labs worldwide have purchased Docetaxel from LC Labs (either directly from us or from our many distributors, many of whom resell under their own labels). Docetaxel, a semisynthetic analog of paclitaxel, shares the latter's mechanism of action: the promotion of microtubule assembly and inhibition of microtubule disassembly. This anti-mitotic behavior results in apoptosis of human leukemia HL-60 cells arrested at the M phase in the cell cycle. Pazdur, R., et al. "The taxoids: paclitaxel (Taxol) and docetaxel (Taxotere)." Cancer Treat Rev. 19: 351-386 (1993). Hagisawa, S., et al. "Docetaxel-induced apoptosis in the mitotic phase: electron microscopic and cytochemical studies of human leukemia cells." Med Electron Microsc. 32: 167-174 (1999). 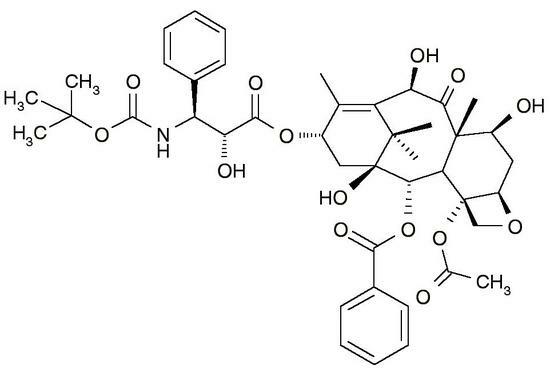 Docetaxel has exhibited significant antitumor activity against prostate cancer, metastatic breast cancer, gastric cancer, and others. Pienta, K.J. "Preclinical mechanisms of action of docetaxel and docetaxel combinations in prostate cancer." Semin Oncol. 4: 3-7 (2001). Yoshida, K., et al. "Phase I study of combination therapy with S-1 and docetaxel (TXT) for advanced or recurrent gastric cancer." Anticancer Res. 24: 1843-1851 (2004). Tabernero, J., et al. "A multicentre, randomised phase II study of weekly or 3-weekly docetaxel in patients with metastatic breast cancer." Ann Oncol. 15: 1358-1365 (2004).